Jim Reilly woke up dead one morning and was really pissed off about it. He snapped open the paper while sitting on the can, the way he did every morning, and found himself staring at an old picture of himself in the Obituary section on Page 6... It wasn't even a good picture.With the Irish Wake just three days away, his best friend convinces him to play along so they can find out who is responsible for the sick joke. The resulting chaos sees Jim reunited with old friends, acquaintances and family members-most of whom he hasn't seen since his wife passed away three years earlier. Is it better to have loved and lost, or never to have loved at all? That is the dilemma Jim is faced with. How do you move forward when the person you have shared nearly every experience with, good or bad, for most of your adult life, is no longer around? The answer for Jim is that he can't. He's stuck in neutral, going through the motions of a life that very much needs him as an active participant. That is until his older brother returns from the sun swept beaches of Santorini for what he believes to be his brother's wake, only to find his brother is still alive-sort of.Sam Reilly has lived his life in a never ending quest to squeeze every last drop out of it. He's run with the bulls at Pamplona, attended the Opening Ceremonies of the Winter Olympics, ridden a bike through the Swiss Alps, toasted with celebrities at film festivals, surfed the blue sea just off the coast of the Greek Islands, in addition to living in a small Upstate New York town where the most exciting things were Sunday night Bingo at the local church and Friday Night football at the high school. The responsible way Jim lived his life is what enabled Sam to live the carefree lifestyle he had grown accustomed to, and now it was time to return the favor. 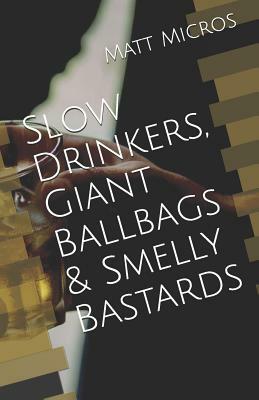 The irrepressibly likable Sam takes Jim on an unexpected and unintentional laugh riot journey through a cast of characters that include slow drinkers, giant ballbags and smelly bastards. A story that is as sure to tug at your heart as give you a belly laugh, Jim finds that it took dying, to actually bring him back to life. Matt Micros received a B.A. in American Studies from the University of Notre Dame and his M.S. in Television, Radio and Film from Syracuse's Newhouse School of Communications, before spending seven years in Los Angeles working in television and video production. He has donned the "referee shirt" for the popular kids game show, "Wild and Crazy Kids," and claims to have attended more weddings than anyone else in the world after working as a wedding videographer, followed by a stint at Creative Artists Agency. A former high school Athletic Director and Math teacher, he currently runs a youth soccer club and coaches the women's soccer team at Post University. His diverse work experience frequently provides the backdrops for his novels, beginning with "The Knights of Redemption" and "The Chameleon"-both released in 2014. "Five Days," released in June of 2014, has garnered rave reviews and has been adapted into a screenplay, while "Nick Nelson Was Here" and the sequel to "The Chameleon"-The Greatest Mann in the World-continue to climb the seller lists. His most recent novel, "The Music Box" is one of the highest rated books on Goodreads. Matt currently resides in Stratford, Connecticut with his wife, Katy, and their crazy, but lovable yellow and black labs, Mr. Beans & Mr. Bode.